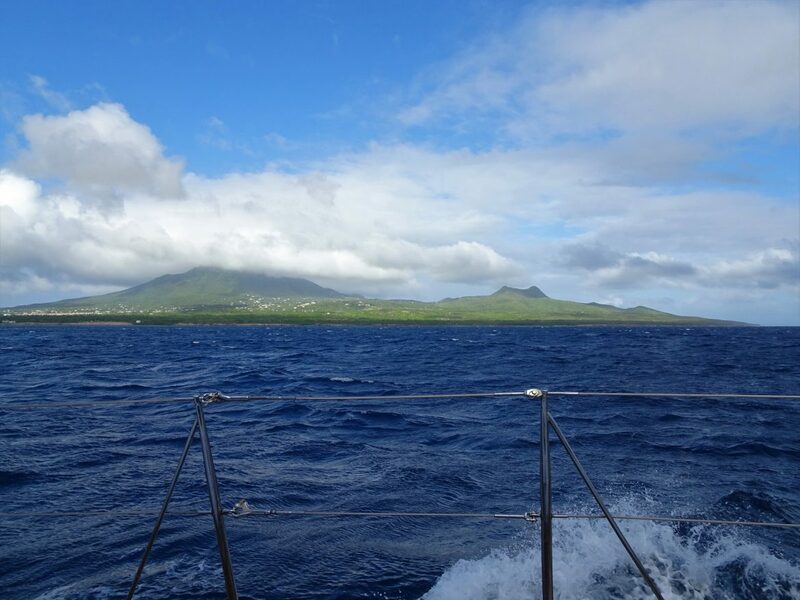 Saturday 29 December: A rather disturbed night then a fast sail to Nevis, via Redonda. If previous night we didn’t get much sleep due to the swell, last night wins the prize for sleeplessness. After the strong winds of yesterday the cross swell and induced rocking was even worse. The area directly around the dock is the least exposed place to anchor. But also very close to the ferries, and we need to be alert when they come or go. We were up late last night staying out of the way of a container freighter, then in the middle of the night the anchor alarm went off. We were unsure if we actually dragged anchor or not, because the wind and the swell are kiting us around all over the place. So we go for the safest way, up-anchor and re-anchor again, at 3am. The bars ashore had karaoke till this time and still blaring music till 6am. Even with earplugs they still kept me awake. Oh, how we long to hear music that is actually music to our ears! Then in the very early morning yet another container ferry arrives to dock. Glen was already awake due to the rocking and aware that the wind had now swung us right in the way of the dock. So again we up anchored and moved, for the umpteenth time! It’s again cloudy with rain showers this morning, but slightly less chill in the wind than yesterday. After breakfast we go ashore to hand back the hire car, and our timing is perfect between the showers. We take advantage of the dry moments and have a wander around the outlets ashore. On a nice lawn and bordered by palm trees there are 3 bars very nicely done, well maintained, with a modern look to them and deck-chairs. And further back a souvenir shop. But all closed. As we stand and admire them, a few rays of sunshine make a big difference, and even a black sand beach can have a certain appeal to it. It has a feel of a mini “cruise liner dock”, and we wonder just how many “boutique cruise ships” actually come by. The exploration doesn’t take us long, and we return to Cloudy Bay just before another rain shower. We’ve decided there’s no point spending another day here. We feel like we have seen the island and we certainly don’t want to spend another night rolling like last night. Sleep deprivation does unhealthy things to our karma. So at mid-day we lift the anchor and are ready to go. 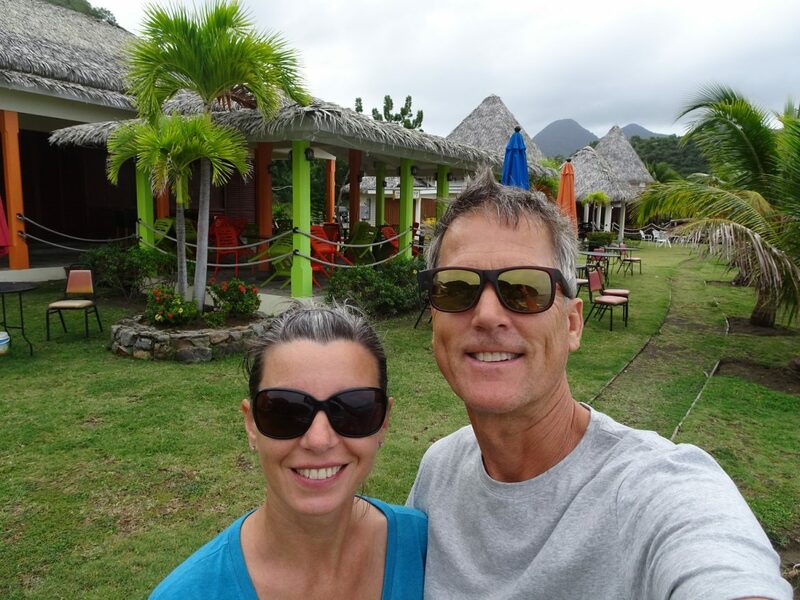 But before we say our farewell to Montserrat, we quickly motor into Rendezvous Bay, the next one along after Little Bay, which has the only white sand beach on this island. Well, whiter than the black sand beaches, but not a white sand beach by any stretch of imagination (if you ask our opinion on it). 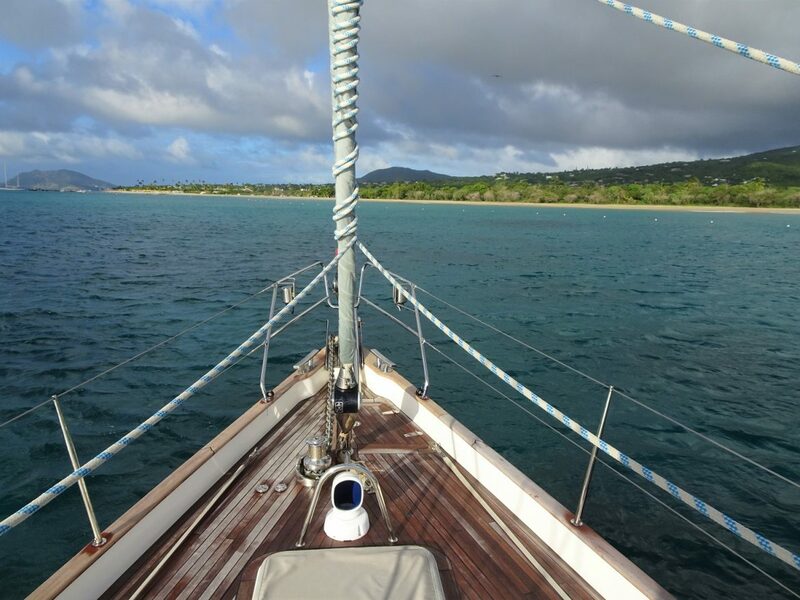 There is 20-25 kts of wind on our stern quarter, and to begin with we start with reefed main and genoa. Even so, we are comfortably doing 8kts. We might need to change to the cutter foresail later on, but we’ll see. We are rolling quite a bit as the 3m waves pass under us, but its not uncomfortable. 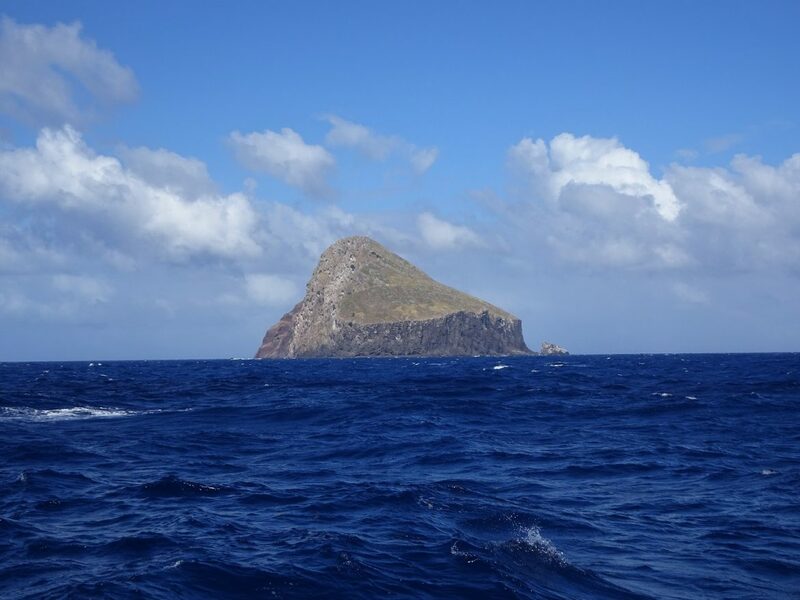 An hour later we pass Redonda (a tiny island that is part of Antigua and Barbuda), which is a big lump of rock, 300m high with shear cliffs into the water. On the chart we can see that it is a volcanic peak of a much larger underwater “island”. We continue to have a wonderful sail heading NE, fast and comfortable. The sails are still reefed, and no need to take them out more as we are hitting 9kts. We’ll certainly get there fast! As we approach Nevis and the water gets shallower, the waves are getting choppier and more chaotic. The wind accelerates around the island, now often touching 27kts, so we further reef both the main and the genoa. And as we start rounding behind the island, the wind accelerates even more, touching 33kts now! Ooph, we haven’t had that much wind in a while, not while sailing! And sailing we are: even with the genoa fully reefed and probably only 1/2 the main out we are literally surfing the waves at 10 & 11 kts on this broad reach. Quite a thrill. And again Glen wonders just what sail plan we’d have if/when it ever seriously blew, like 40kts and more… maybe just the mast?! Cloudy Bay has a very big rig, great for light winds but a bit big when it really starts to howl. Later on, in the shelter of the island the sea calms down and we pull onto a beam reach. The water is now flat but the wind off the land, as it bends around Nevis’s huge volcano, is extremely gusty. 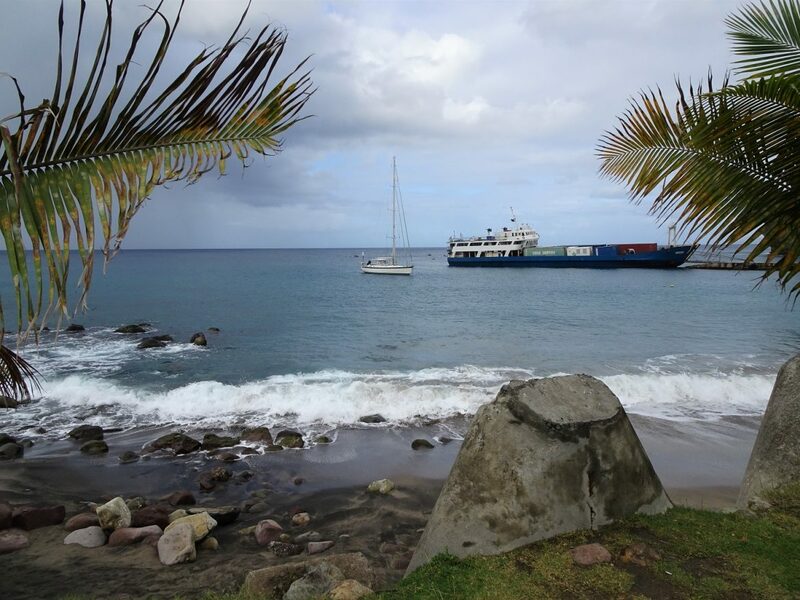 As we sail up to the main town of Charlestown we can’t help drawing similarities to the devastated Plymouth on Montserrat. Plymouth must have once looked just like Charlestown: pretty buildings among very green vegetation on the bottom of the gentle slope of the towering volcano behind it. Nevis island is basically just one massive volcano, towering 1080m above sea level, with its top shrouded in a perpetual cloud. 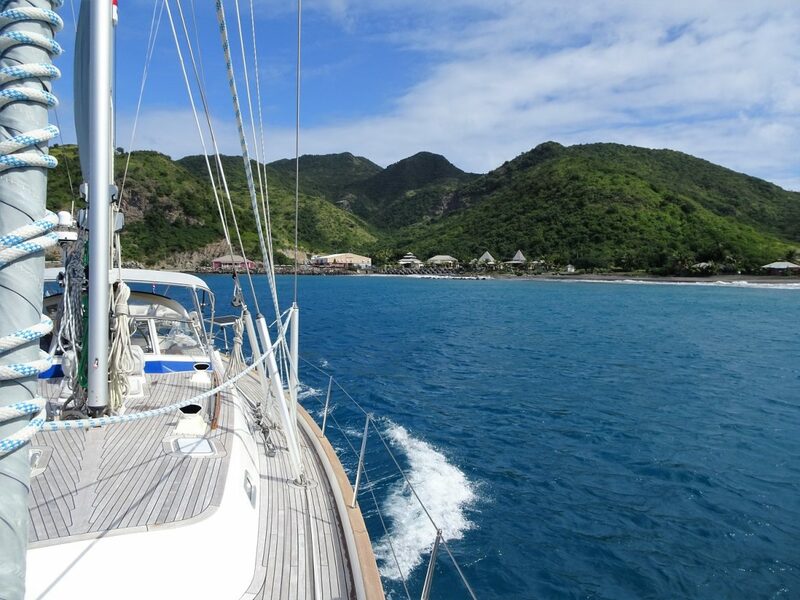 Most of the yachts are on mooring buoys, but we prefer to anchor. And we drop the hook right in front of the volcano, having a beautiful view over the green mountain and wild beach in front of us, the Four Seasons resort to our port and Charlestown to our starboard. What is not so great are the extremely strong gusts as the wind funnels either side of the volcano, making the anchor yank hard each time a gust hits us. There is some swell coming in, but far from being uncomfortable. Nothing could be worse than last night! The customs office is closed by now so there is no rush for us to go ashore. We’d rather have lunch, as it’s late afternoon already. So we finally get to eat, listening to the wind and admiring the view around us. Only half an hour of daylight left and we feel rather drained, so we decide not to go ashore for the evening. And in any case, this anchorage is about a mile from the town. The thought of coming back in the dark, in this wind, on a wet dinghy ride, is not appealing. So we chill on the boat for the rest of the evening. Enjoying showers with our lovely fresh home-made water and finalizing the Antigua video, while the wind squalls howl in the rigging. Looking forward to seeing the new island tomorrow. But looking forward even more to bed!